Facility Management Miami | CSI International, Inc.
From our start in 1989 CSI International, Inc. has been a customer focused and results demanding organization. The motivator behind our Quality Program is the instillment of quality that pays particular attention to customer’s expectations, includes every employee, continuously measures performance, and thrives on continuous improvement. Inorder to achieve this our Quality Plan has as a base, a management plan, and a set of disciplines that are coordinated to all facets of the company to insure that all employees consistently reach or exceed our customer’s needs. CSI’s senior management team has worked to organize its Facility Management strategy and operations to be in line with our customer’s needs, and to develop and sustain a way of life with full employee participation. Quality for CSI is a process of continuous advancement, not just an observation platform. What that means is supervision and management must enforce a standard of Facility Management the line worker follows and trusts. To meet this challenge CSI has established the position of Director of Corporate Quality and Training for the purposes of managing CSI’s QA Program and to directly oversee the quality process throughout all aspects of our company. This job relies on direct reporting to the Chief Operating Officer and keeps a watchful eye on the execution and devotion to our high standards for evaluating job performance, implementing training programs and acknowledging and surpassing our customer’s expectations. With these things in mind CSI has created the Eye on Quality program. This program’s objective is to far exceed traditional service quality levels for our clients. Our clients receive regular quality reports via email or print copy. These update overview reports will provide a full work-site overview while including graphs for visual reporting. As a bonus, our Eye on Quality program includes typical surveys and inspections to assist CSI’s Quality Assurance Team in determining customers’ management and their client’s satisfaction with the quality of our Facility Management. Every company has unique challenges that demand we individualize a program that fits well with its culture. Guided by the stipulations and adjusted for your individual needs, inspections and surveys keep management in the loop, supervision responsible, and employees informed. The outcome is the achievement of service excellence for the client. CSI deploys many standard validation tools to guarantee that we are continually providing the Facility Management promised with uncompromising quality. Green Cleaning is described as “Cleaning to protect health without harming the environment” - Executive Order 13101. 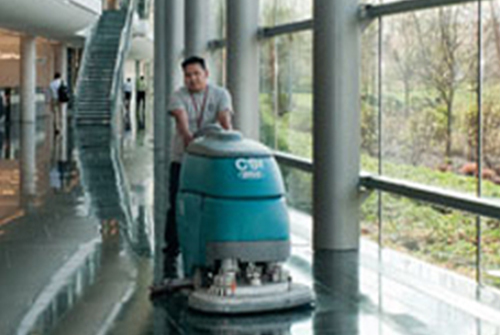 CSI is devoted to delivering a clean and healthy working environment for every one of our employees and yours. Presidential Executive Order 13101, delivered in 1992, by former President Bill Clinton required the building managers of more than 100,000 federally owned or operated buildings worldwide to begin the use of green cleaning products. Executive Order 13101 also established what green cleaning was for the first time, saying that green cleaning is the “use of products and services that reduce the health and environmental impacts compared to similar products and services used for the same purpose.” Green cleaning now means the most favorable use of products that minimize indoor pollution while reducing environmental pollution and favor renewable materials. Maintenance of a healthy environment is the joint responsibility of management and staff at every level of the CSI organization. All staff is trained and held responsible to achieve the goal of minimizing the exterior’s impact on the local environment and to stress and execute environmentally safe, minimal impact cleaning chemicals and procedures. CSI comprehends that the idea of stewardship-- "the duty for handling, monitoring the quality or carrying out, state or condition of an institutional or industrial structure"- is important to the green cleansing perspective and essential to the success of our green cleansing program. CSI is dedicated to follow a set of stewardship principles that have actually been established by pioneers of the green cleansing movement. These concepts will assist in our efforts to be great stewards of the buildings we service, their residents, our workers, and the overall environment. Tidy for health first and appearance 2nd, Minimize human exposure to impurities and cleansing items, Recognize cleaning as an environmental health benefit, Dedicate to occupational advancement of cleansing workers, Interact the worth of healthy buildings, Decrease particle, chemical and moisture residue when cleansing, Guarantee employee and resident safety, Contain and lower all toxins getting in the structure, Dispose of cleaning products in ecologically safe ways, Establish and record routine maintenance schedules.